Updated Friday March 22, 2019 by Kitchener Sports Association. Networking: 6:00 p.m Seating for dinner: 6:30 p.m.
KSA President Bill Pegg presented Ted Hastings (LCTC President) and Stephen Davis (competitor) with a travel grant of $2,000. In turn, they thanked KSA for supporting the 9 LCTC athletes who competed at the Hershey Canadian Indoor Championships on the weekend in Montreal. They were also proud to recap the results: Stephen Davis who won the gold in the U16 boy’s high jump with a career personal best and silver in the U16 long jump; Brendan Chapple won silver in the U16 1200m and bronze in the 800m. Avery Hastings was another double medalist with bronze medals in the U16 girl’s pentathlon and U16 shot put. Other medalists from Laurel Creek were Scott Arndt with silver in the U20 800m, Daniel Khan with silver in the U18 800m, and Spiros Goros with silver in the U16 pentathlon. Congratulations to all as they go back into training for the upcoming outdoor meet! Barb Ward and Mark Stubbs, in attendance on behalf of the K-W YMCA Outdoor Gym Project in Victoria Park (Kitchener), provided an overview of the project, an update on funding, the types of equipment being considered and various alternatives. 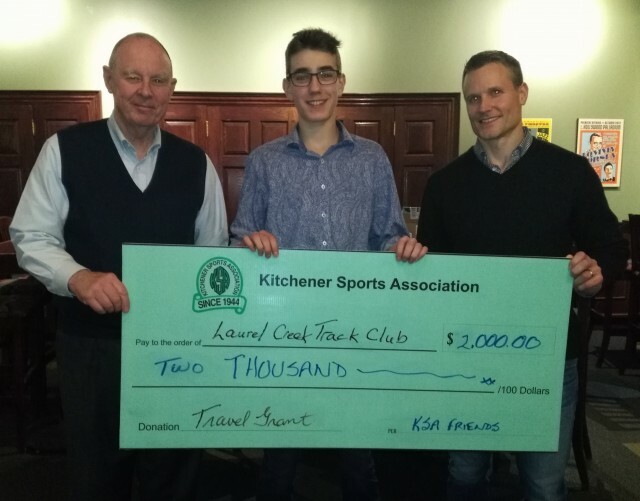 The KSA Grants Committee, with ratification of the membership at the last KSA dinner meeting, had already approved $10,000 in funding to be used for equipment and a ceremonial cheque presentation followed the group's update. Hope we can celebrate with a KSA "exercise" meeting at the site soon! The Junior Ball-Stars Basketball Tournament has grown to include over 60 teams this year and required some additional funding support. Kat provided a financial breakdown and the various groups supporting this year's event -- including KSA with $2,500. Attendees provided their input as KSA continues its review of our programs, policies, procedures & governance with the assistance of a consultant. Discussions included possible improvements to the scholarship program, membership criteria, eligibility for funding, ideas for additional KSA involvement in the community (and vice versa), the scheduling & cost of KSA dinner meetings --- lots to think about! Everyone was reminded of the deadline for scholarship applications and upcoming dinner.